So for the last three days I’ve been doing something I don’t normally do. In fact, I have never done…. I am dog-sitting. That’s a stitch isn’t it…for those who know me! How goes it, you ask? Well, it occurred to me while out on a walk this morning with two dogs (mine and our guest) that it’s a lot like taking care of a friend’s child. I’m worried about the dog liking me…worried if the dog is comfortable and having a good time….worried about something happening to the dog…worried about how the whole thing affects my dog….etc. etc. 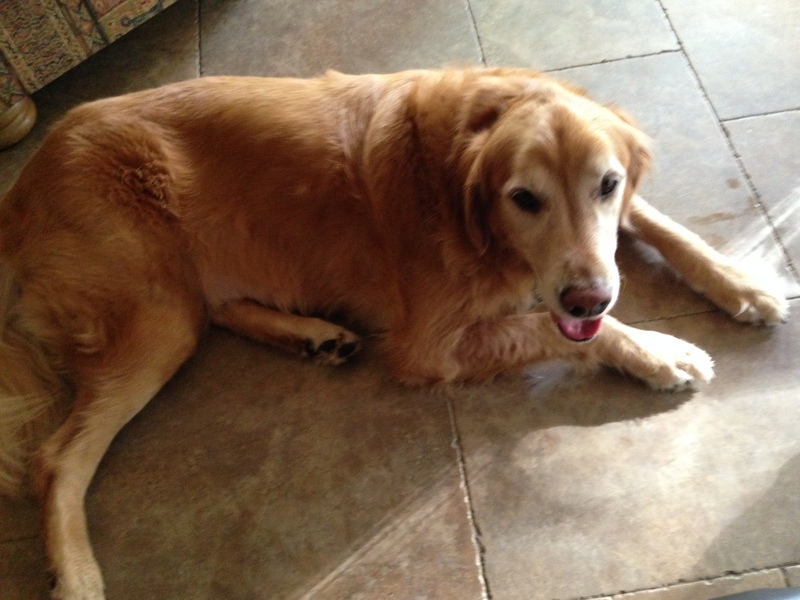 Our four-legged guest, Cooper, is a Golden Retriever. I think he is six years old (my dog turns five in November). Cooper is a rescue dog and he’s got some issues. What dog (or person) doesn’t, right? Cooper is a big dog, weighs about 85 pounds I’m guessing, and he’s got some hip dysplasia going on. He sheds like the dickens, he smells…like a dog… and he is scratching a great deal (his owner assures me that it isn’t fleas, but I am not at all convinced!). Cooper is also very shy…even when pooping. He wouldn’t do the doo on any of our walks, preferring to wait until he returned to my back yard, going off in the corner and away from the poodle. And, even after three days of being in my home he is tentative about entering any room. He moves slowly to follow me and waits tentatively in the doorway with a look that suggests “may I have permission to enter ma’am.” I will say that Cooper has impeccable manners. When I put Cooper’s water and food bowl down my poodle makes right for it, dismissing his own. I have to issue a stern “NO” to poodle…really, where are your manners Brando!. Cooper will not touch my dog’s food or water dish, even when his own water dish is empty. He waits for me to fill his and that’s what he drinks from. And boy does he drink. I’ve never seen a dog drink so much water. I even had to call my friend in California to ask if that was normal. She thinks not. I texted Cooper’s owner and she confirmed that Cooper drinks a lot of water. Hmm…. 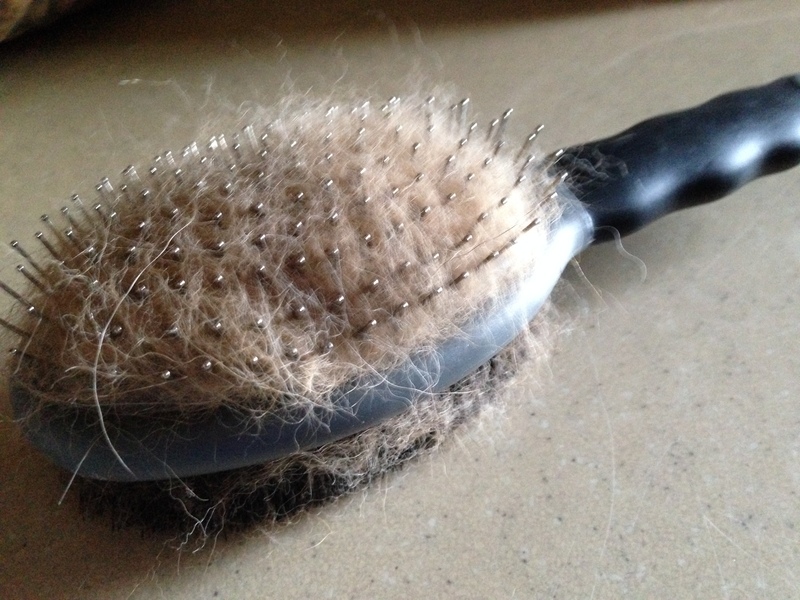 Cooper’s Brush. That’s a lot of fur! Walking the two dogs has proved challenging–and comedic for those watching, I’m sure! The two dogs are not even close to the same weight nor build. Brando weighs 34 pounds to Cooper’s 85 or more…..and Cooper is not exactly as well trained on the leash as I’d like. He kept crossing in front of me causing me to nearly fall over him several times as I tried to get the hang of it all. When I would try to move him back to my left side it was like trying to move a ton of bricks. He is one stubborn dude to budge that’s for sure. All I have to do with Brando is give him a slight nudge and he’s moving. I’m quite sure I’ve been providing entertainment to cars passing by as I stumble along with the two dogs, frequently stopping, then going..then having to rearrange the leashes while trying to keep both dogs close at my left side. I was thrilled that Cooper didn’t seem to care much about other dogs along the way; he just kept his head down and lumbered along. Also interesting is the fact that I have yet to hear Cooper’s voice. He has not barked once…not at the squirrels and chipmunks scurrying in the yard….not at other dogs….not at Brando. Brando barks… a lot…which isn’t entirely a bad thing…he’s a good watch dog that way. When I think about it, I think I got extremely lucky with this quiet, relatively low-maintenance dog. After all, I’d never done this kind of thing before and truthfully I wasn’t exactly thrilled about having to do it either particularly when my husband informed me he’d be out of the country the entire week. “Just peachy,” I remember saying mildly peeved. I had expected a little help over the weekend. Well, I couldn’t (nor wouldn’t have) backed out of the deal and frankly, it’s good to step out of the old comfort zone every once in a while, especially as we get older. Having my four-legged house guest has made me see that I’ve got some habits that if disturbed just a tad makes me just a wee bit cranky. There certainly isn’t anything wrong with routine, but I don’t want to become like ONE OF THOSE OLD PEOPLE that get their knickers in a twist with just the slightest change in routine. Those folks are back in their “terrible two’s” if you know what I mean. I vow to be different as I slide into my golden years. So it’s good that I’ve shaken things up a bit for a week. I’ve enjoyed taking pictures of Cooper on my iPhone and texting his owner with daily updates so that she could enjoy her vacation knowing that her “baby” is fine. And, even though the two dogs don’t play together very much, it’s nice that my poodle is getting some additional stimulation which, just as it would be for a human kid, is good for him. Having said all that…I’m ready for the dog-sitting to be over, which won’t be for another two days. Even though my guest is sweet, quiet and well-mannered I’m still a nervous ninny about the potentiality of accidents (you know the kind). I’m finding it just a bit difficult to relax though I’m sure with time, this would subside. And, all the hair flying around is mighty annoying. I’ve got enough problems with my hair getting tangled in the vacuum cleaner roller not to mention having to pull out the vacuum several times a day for a dog. Another reason to feel so blessed about having a poodle in my life. Brando does not shed…nor does he smell like a dog….because well…he’s a poodle! And, so far, I’ve stuck close to home worried what kind of mischief TWO dogs would get into when I’m not around. It’s sort of like when you have two kids…lots of good, bad, and ugly mischief can be had while home alone. So, I made a mad dash to the gym on Friday and was back in an hour and a half. I came flying in the door expecting to find something bad and all was just fine. I checked upstairs and down….everything in place…no accidents and no cushions in tatters. Whew. That’s a relief! I also ventured out quickly on Saturday worried the entire hour I was gone because it was pouring rain and the dogs had not gotten proper exercise. Now, I could watch my nephew for a month of Sundays…or more….or for the rest of my life….but I’m not so sure I would enjoy another dog in the family. I marvel at folks that have two (or more) dogs…I always wondered what it would be like and now, after this week, I know. Two kids…OK….two dogs….not my deal. Maybe it’s because of all the poop. Brando is a medium-sized guy…so, smallish-medium-sized poo. Cooper: big dog…BIG POO. …just as all that goodness…..today…. Cooper poops in the yard…. I grab the poop bag to pick up poo…. I see little white worms wriggling in the poo…. I shriek in alarm and disgust….